Are you searching for simple PHP Pagination for a starting level of php programmer then you are at the correct place and This PHP pagination script or example is very well helpful to you. By using this PHP Script for Create Pagination with Previous and Next page link, First and Last page link also. Pagination is a style to make partition between content into different pages. Here we can define every pages as a separate URL. By click on that URL or number of that page, user can visit the content of that Page. For every page has number which is in incremental Page number. 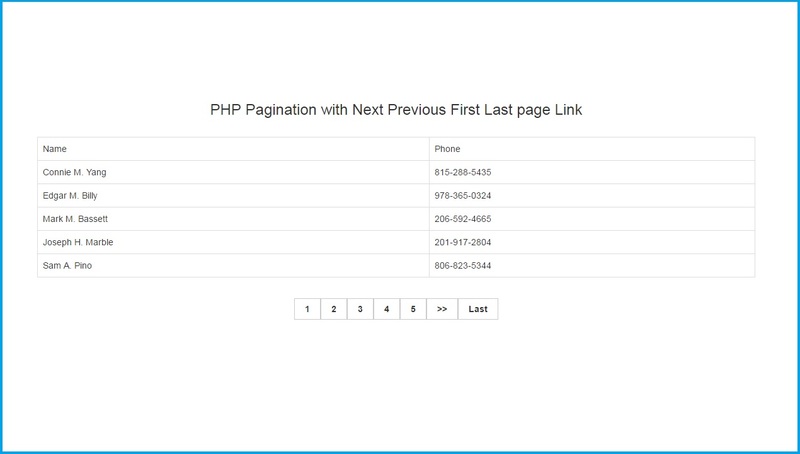 You can use this simple PHP pagination script or PHP pagination code into your project. For making simple pagination We have used PHP programming code with mysqli. We Hope with this PHP Pagination Tutorial using PHP MYSQL will be helpful to you to get the simple learning about the pagination as a beginner in php.